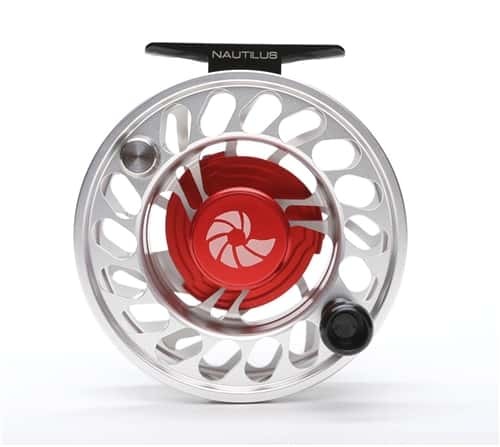 Our newest addition to the Nautilus Family: Dual action CCF-X2 drag system with twice the drag strength (20lbs+), twice the smoothness and half the startup inertia. Fully Sealed, loaded with hybrid ceramic bearings, TPX bushing and oversized drag knob with infinadjust range settings. Activseal - Perpetually repels contaminants from braking system. Giga: The Uber arbors of fly fishing reels. Reel in more than a foot per turn and feel the fish flopping back to you on the surface. A unique design feature of these spools are grooves that let the bottom of the backing breathe to promote faster drying. The giga arbors have redefined large arbor reel design. InfAdjust - The over sized CCF-X2 drag knob features the InfinAdjust drag control system: six turns of the drag knob take you from zero to 20+lbs to allow you to precisely adjust your drag tension without fear of over adjusting. Very good made Reel , I like it very much.